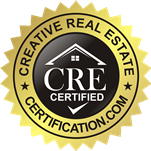 Cleveland Ohio's #1 House Buyer! Above all else, your bedroom should be your sanctuary. At the end of a long work day, there needs to be a place where you can flop on top of your fluffy duvet, sink into a comfy chair, and snuggle under the covers to let your stress slip away. The atmosphere needs to be just right. However, today’s bedrooms have become multi-functional rooms, which can make creating the right atmosphere slightly difficult. 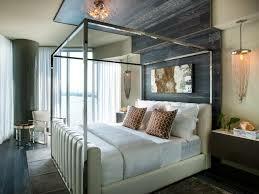 As homes decrease in square feet, the bedroom , like many rooms, has become a place of compromise. Instead of simply having a room with a bed, modern bedrooms often include small work or reading areas, making lighting especially tricky. But the process can become much easier when you break it down and consider the type of lighting you need, the functionality of your space, how much lighting will be needed in each part of the room, and the style you want for your bedroom. Think about the type of lighting you want and need. Bedside lighting is one of the first points of consideration for a bedroom. These lights can be a great excuse to add something fun and unique to accessorize your room. Table lamps on bedside tables or nightstands is a classic option that provides a good sense of symmetry and balance to a room. Pendant lights are a fantastic option, as are sconces for bedside lights. It’s an incredibly si mple and minimalistic look, but still allows for a splash of flair and style with lighting choice. It’s always good to implement a ceiling light with a dimmer, or a piece that casts more of a soft glow throughout the bedroom. While overhead lighting could light the entire room, the ambiance is better when table lamps, floor lamps, and sconces brighten the parts of your bedroom that need it. Sconces and wall lights can also be used to enhance the ambiance of a room and cast light in areas that lamps and ceiling lights won’t quite reach. 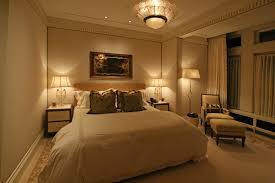 Floor lamps are a good option if you don’t plan to use much overhead lighting in your bedroom. Because of the structure of these lamps an d the fact that they use bulbs with a high wattage, placing a few throughout your bedroom will spread light more effectively than several table lamps. Think about how each piece of lighting will be used. Decide where you want to put the lamps. Make sure there is an outlet nearby to avoid unsightly extension cords. Determining the space where the lamp will go will help you decide what size is needed where. Do you need a lamp with a narrow base? Do you want a tall lamp with a wider shade? These variations won’t work in every part of the room. Bedside lamps should be the correct height. When you sit up in bed, you want the light to shine on any reading material, but not hit you square in the eye. These lamps provide enough close-range light and are easy to switch off when you’re lying down. A good test is to see if the bottom of the shade is at your eye level when you’re sitting up and reading in bed. A great alternative to a standard bedside lam p is a lamp with a swing arm, which is adjustable for any bed or person’s height. 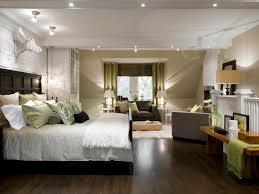 Think about the amount of lighting you want in each area of your bedroom. 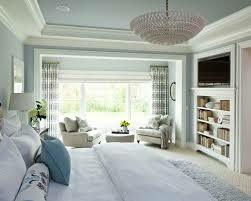 In many homes, bedrooms have become rooms for lounging, watching TV, reading, exercising and even working. Overall, you want to accomplish a sense of soft lighting, and lighting that will allow you to accomplish specific tasks. Be sure to take natural lighting into account as well. What will your bedroom look like at different times of day? When do you spend the most time in your bedroom, and doing what? What is the lighting like then? Think about your bedroom’s style. Lighting is a huge part of your bedroom’s style. Really think about the look you’re trying to achieve, and carry that theme through in your lighting. You want your room to flow. As a designer, I always put chandeliers in bedrooms. I can’t stand the sight of a ceiling fan, though many clients fight with me on that one. Some people cannot sleep without a fan. However, aesthetically, they are very unattractive. 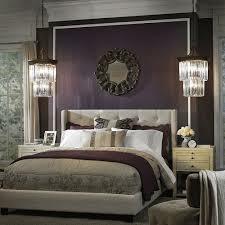 Nothing like a great chandelier, some great lamps, and a pair of beautiful sconces to tie a bedroom together. I’m one of the people you can’t stand haha…I have to sleep with a fan. I think it has to do with the “white noise,” more than the cooling effect. But back to the article, be sure you put the light switches in the most convenient and accessible places. Seems obvious, but you’d be surprised at the places people put light switches.